Get Creative with 1, 000+ recipes - choose from sous vide guides and recipes created for home cooks of every skill level by award-winning chefs, with simple directions to walk through each recipe with ease. All available free of charge. Great for beginner and veteran chefs! 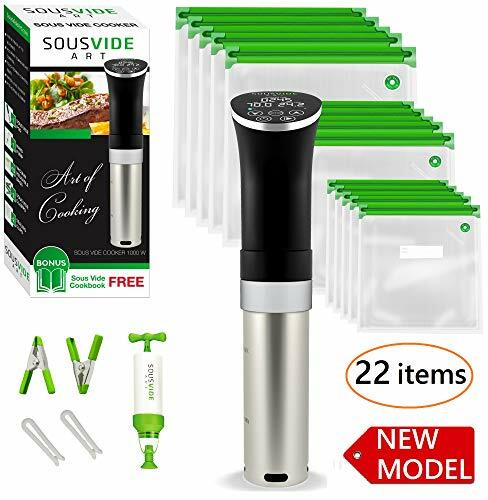 Accu slim sous vide immersion circulator by Instant Pot is designed for the gourmet who strives to create 'restaurant quality dishes' in the comfort of their home. The Accu slim sous vide cooks food at very precise temperatures 104F - 195F / 40C - 90C for a period of time (up to 72 hours) to achieve succulent, nutritious and delicious meals. The circulator creates and maintains an even and accurately controlled cooking water-bath for perfect cooking results, retaining the vitamins and minerals from within the food, natural flavors are intensified, food is healthier, more tender, juicy, and tastier. The Accu Slim is versatile, easy-to-use, easy-to-clean kitchen appliance - eliminate works professionally. 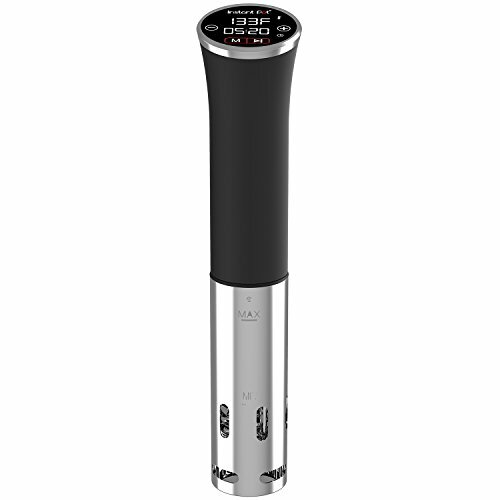 The sous vide immersion circulator is ideal to use on meat, poultry, seafood, eggs, vegetables, and fruits. Easy-to-Use - Easy-to-read display, touch-screen digital controls, lightweight stainless steel with a rubber coating on the handle. Active Pump System - Accu Slim Sous Vide Circulates water without relying on convection currents, resulting in uniformly heated water bath free of hot or cool spots. Includes a 12V DC motor - Extremely quietly and has enhanced durability in comparison to standard AC motors used. Motor stops when removed from the water. Clamps securely - To the 6 and 8 Quart inner pot either in or out of the Instant Pot, and can be used with or without an Instant Pot. Sous Vide Technology - this is the Trend in Cooking! If you have not gotten acquainted with the technology of cooking delicious dishes with the Sous Vide method yet, then it's time for you to do so. The essence of the method is very simple: the products are vacuum sealed in special sous vide bags and cooked in water, the temperature of which usually does not exceed 158 F. For this, sous vide machine or sous vide immersion circulator is used. 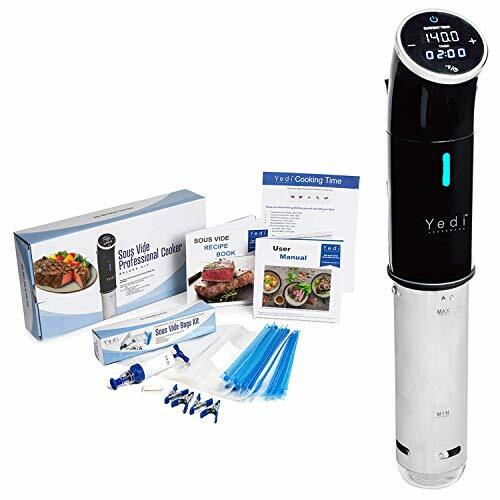 Benefits of Sous Vide Cooking: Sous Vide Immersion Circulator will deliver incredibly tasty, juicy, and delicate dishes through the preparation of food at precisely controlled low temperatures. Products will be cooked evenly from edge to edge and will retain more vitamins and nutrients than other cooking methods. You can't waste time in the kitchen while Sous Vide Cooker prepares tasty and healthy food for the whole family, because Sous Vide Cooking is Hands-Free Cooking. Just put the food in a special bag, place it into the water, set the desired temperature and timer, and quietly do your own thing until the timer sounds. Sous Vide Cooker by SousVideArt has certificates ETL, ROHS, REACH that guarantee quality, safety and durability of use. 12 months warranty is providing. 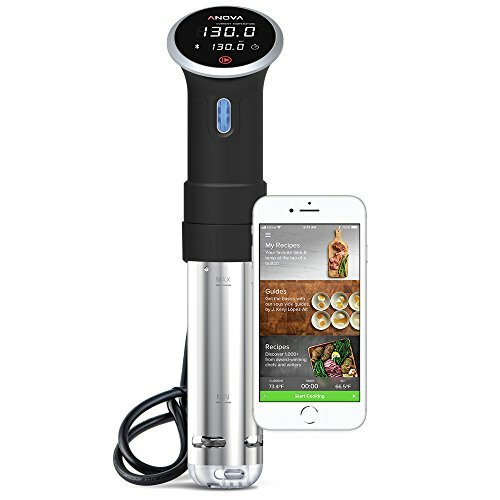 HANDS-FREE COOKING You don't need to waste time in the kitchen while Sous Vide Cooker prepares tasty and healthy food for the whole family. Get incredible results with minimal effort and time! SAFETY and WARRANTY Sous Vide cooker has certificates ETL, ROHS, REACH that guarantee quality of safety and durability of use. We provide a 12-month warranty.